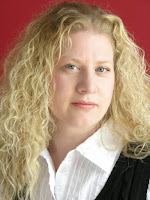 Reviews Coming at YA (*Kids Too*): Cici Reno Blog Tour--Kristina Springer's Guest Post! Cici Reno Blog Tour--Kristina Springer's Guest Post! Are you Cici Reno in Cici Reno #MiddleSchoolMatchmaker? 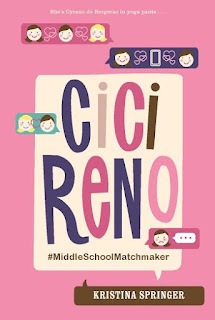 guarantee that in my newest middle grade book, Cici Reno #MiddleSchoolMatchMaker, Cici is nothing like me. I only wish I was half as cool as this kid. In my first published book, The Espressologist, the main character Jane might have been a little bit too much like me (albeit a much better version!) which led to friends and family attending my signings and jutting index fingers at me while yelling, “You’re Jane!” I wasn’t making that mistake twice. Cici Reno is a really cool, laid back kind of girl who is great at giving advice. She’s very zen. Maybe it’s from all the yoga? Her mom owns and teaches at Peony Lane yoga studio in a strip small near their house and Cici is often taking a class or just hanging out there. Despite her small stature in comparison to her fellow classmates, Cici just oozes self-confidence and is a great talker. So much so that her shy best friend Aggie asks Cici to contact that guy she’s crushing on on her behalf. No problem for Cici. She strikes up an online relationship with him and soon finds she’s falling for him herself. Which can only lead to trouble. I’d love to have had as a friend in middle school. Check out Cici for yourself and let me know what you think! I love getting e-mails and reviews.